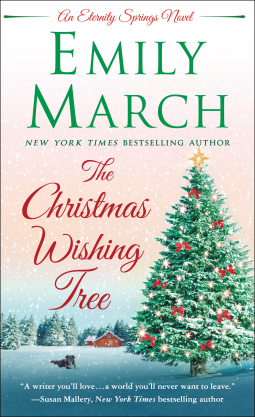 The Christmas Wishing Tree by Emily March is a story that captures my interest right away. I feel the emotion from the characters as though I were the one going through it all. The ups and downs are realistic. Sad, heartbreaking, and emotionally gripping Emily March writes a tale worth reading. From danger to healing, there is so much to offer for readers like me. Plenty of action, intrigue, and what-ifs to keep me guessing the whole way. I was not sure how the book would end. It could have ended completely different. Inside, I meet a young woman who took a young boy into her home and heart. The boy’s mother is too young and battling an abusive situation. She gives birth and the boy is given to Jenna Stockton. From there the boy has been in Jenna’s care. She raises him like her own son. Until a stalker and dangerous threats start to happen, Jenna and her son’s lives become anything but happy ones. I love how Emily March wove hope and love into scenes despite all the risks and danger present. It made my heart melt at the boy’s innocent talk with a man whom he believed to be the real Santa Claus. How can a man hurt the young boy’s hope and Christmas wish? Devin des everything he can to help the boy on the phone. Jenna at first thinks Devin is the stalker but soon realises her mistake. From there Devin becomes a ray of sunshine for both mom and boy. But the troubles they go through are far from over…can their nightmares end? Will their lives know no peace or happiness? The Christmas Wishing Tree brings back the innocence and heartwarming memories of what the season gives us. Hope, faith, and kindness and maybe, love. Overall, I would highly recommend this book to all.